NOVA Design and Build prides itself in selling superior quality in stock cabinets as well as offering stone countertops, windows, doors, and flooring along with providing in-house quality installation services. NOVA Design and Build is easily accessible within the central region of Northern Virginia with a 3,200 square foot showroom and warehouse located in Sterling, Virginia. 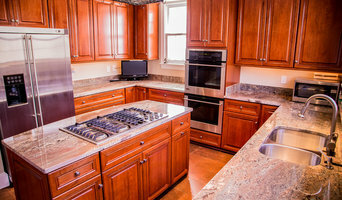 We offer full service Kitchen and Bath Remodeling. We also specialize in built-ins, mudrooms, libraries, and wine cellars. Our products are high quality cabinetry and stone products that are direct to the consumer. We offer a large variety of quartz and the finest granite countertops as we buy direct from stone slab wholesalers. We offer 20/20 design service to help with the visualization of your project. Our depth of knowledge with cabinetry and stone countertops is extensive and rich. We work with homeowners, contractors, and businesses. We can easily make your dreams a reality with our affordable pricing, knowledge, and direct to consumer product offerings! Have a designer look at the fraction of the cost of a total kitchen remodel! On average we spend two and a half years of our lives cooking. Shouldn’t you love your kitchen? Kitchen Saver’s quality custom cabinet refacing brings new style to your old kitchen. 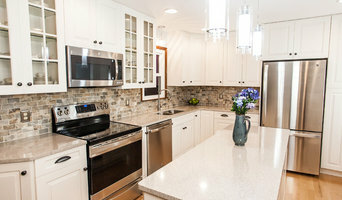 Visit www.KitchenSaver.com to learn how Kitchen Saver can transform your old kitchen in as little as five days without the total remodel price. At Shenandoah Kitchen & Home we breathe new life into historic wood — chestnuts, walnuts, cherries, pines and oaks reclaimed from old barns, agricultural buildings, and rural structures from in and around Virginia’s Shenandoah Valley. We transform it and handcraft it into fine furniture, flooring, and cabinetry just for you. I am a craftsman located in the Shepherd Park neighborhood of Washington, DC. I build custom high end modern furniture and European-style cabinets for clients throughout the DC area. Terry's Custom Woodworks has been doing business in Northern Virginia since 2000. We have 30+ years experience. We are rate A+ by the Better Business Bureau. We are licensed in the State of Virginia and the County of Fairfax. Kitchens get a lot of use, and your cabinets are being opened and shut, banged against, leaned upon, and subjected to heat and grime every day you cook. When it's time to get a new set of stylish and durable cabinetry, count on the professionals at Terry's Custom Woodworks. We're an experienced cabinetry contractor that has outfitted kitchens across Fairfax, Arlington, and Loudon Counties with custom cabinetry, and yours can be next. Our craftsmen take great pride in their products, including pre-built cabinetry ready for installation and custom pieces designed to your specifications. Come to us first for: All wood cabinet refacing Custom cabinets Kitchen cabinets Custom home offices Bedroom storage Custom furniture (wardrobes, armoires, desks, etc) Our wooden cabinets are great not only for the kitchen but also any room in the house where you could use attractive, reliable storage solutions. Don't live with plain or damaged cabinetry for one more day when Terry's Custom Woodworks can solve that problem in a jiffy. We take pride in arriving for each project on time and performing to your expectations. To learn more about our cabinetry contractor services or to receive an estimate, give us a call at our office here in Reston, VA.
At Old Dominion Design we specialize in creating custom kitchen & bath layouts utilizing cabinetry to suit each client’s needs. When planning your new home or remodeling project, it’s important to employ experienced, qualified designers to ensure the final design is both functional and beautiful while tailored to the way you work within the space. Old Dominion Design has been in business for over 20 years and our principals & staff have over 50 years combined experience to help meet your needs. Old Dominion Design represents several lines of cabinetry ranging from the moderately priced mid-range cabinets to the more high-end “fully custom”. All cabinets offered by Old Dominion Design are high quality in both material and workmanship. Most are made with all wood construction, including dove-tailed drawers and full extension soft closing drawer glides. Jed Dinger Design is a full-service, custom cabinet shop, serving residential clients in the DC Metro region. Our clients come to us with a wide range of projects. From a simple side table to a home office with floor-to-ceiling millwork. We're ready to help you realize a solution to your design challenge in a way that you feel valued as a client, and included in the process. Your custom cabinetry is produced completely in-house by Jed Dinger Design, from design through finishing. Your project is rendered in 3D CAD software before fabrication which allows us to edit and modify the designs quickly and efficiently. It also provides you with a clear idea of what to expect, before the project is delivered. We install all of the work we produce, maintaining quality control from our first meeting through to the end product. *Authorized Wellborn Cabinetry Dealer* A family owned business since 1987. Carefree Kitchens / Carefree Industries is one of the area’s leading distributors of fine cabinet works for residential projects as well as a recognized leader in manufacturing of custom commercial cabinets and countertops. With Locations in Linthicum, Baltimore and Frederick, MD. along with its own delivery fleet, Carefree is able to service the MD/DC/NOVA/DE/ PA Regions. Boisvert Woodworks, LLC is a family owned and customer service driven business located in Frederick, MD. While Custom cabinetry is our specialty, we have built numerous custom in home bars and even showcased our work in the National Museum Of Civil War Medicine in Frederick, MD. If you are looking for custom cabinetry or woodworking in Frederick county and Montgomery County we would love to turn your dreams into reality. Loudoun Designs specializes in high end custom build-ins and custom bars. Jon is a master craftsman with over 10 years of experience. He has applied the level of sensitivity and dedication to perfection that is required to create precision to crafting fine, custom woodwork pieces for homeowners, contractors and architects. Jon's reputation rests on a belief in unyielding care and craftsmanship, supported by his own drive for perfection. His meticulous approach to his art results in unique works of outstanding quality and value. With each project, Jon endeavors to create a rhythm of style and function that requires a high aesthetic appreciation and deep dedication to the art. He develops and builds a reflection of your desires. A piece that is custom-built for your needs. Waypoint Living Spaces® makes remodeling easier with design professionals that offer more than beautiful cabinetry for kitchens, baths, or any room in your home, we help provide a stress-free remodeling process that supports you every step of the way. Visit our website for more inspiration and to find a Waypoint Living Spaces dealer/designer near you. Law school or lumber? Thirty five years ago Eric Smith was at a crossroads. He decided to pursue his passion for woodworking that began as a child in his father's workshop. Turning his back on a full ride to law school, with a fair measure of trepidation he set out to use his hands to improve the quality of home life for others. Building upon the foundation of a healthy work ethic, coupled with his God given design talent, he found plenty of opportunity to support his growing family of 10. Along the way, Eric met Dan Swain, who had devoted his life since college to the cabinetry business. The two combined their talents and experience to form Potomac Shores Custom Cabinetry. Initially, building cabinets from a modest barn facility, Potomac Shores has grown to support many individuals yet remains the same family run company that takes pride in their workmanship and cares for their customer. Dan and Eric find joy in providing well designed spaces filled with well crafted cabinetry. Their desire is to improve home life everywhere. Let us Transform your kitchen!!! Sk Interiors and XPR Painting and Remodeling are pleased to announce... Cabinetworks!!! Full service quality cabinet painting. Unique spraying.. process Experienced designers available to help assist with color selections and more!! Choose custom options, backsplash, lighting, pendants available. Cabinetry professionals design, construct, refinish and repair banks of conventional cabinets, but they also create customized storage and shelving for home offices, playrooms, bedrooms, media rooms and other spaces. They’re in the know about Maryland design trends and different cabinet styles, as well as the latest in special inserts and other options that boost functionality. Cabinetry professionals also can craft furniture to your specifications, such as a corner cabinet for a kitchen or a dining room hutch. 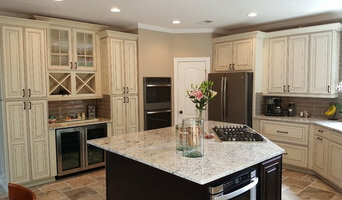 In addition, Poolesville, MD cabinetry pros can help you give worn or dated cabinets a makeover. They can replace doors; add glass inserts, decorative moldings and other details; or give cabinetry a new coat of paint or specialty finish. Your cabinetry professional might work closely with a Maryland kitchen designer, builder, remodeling contractor or interior designer. Here are some related professionals and vendors to complement the work of cabinets & cabinetry: Kitchen & Bath Designers, Kitchen & Bath Remodelers, Interior Designers & Decorators, Closet Designers and Professional Organizers, Woodworkers & Carpenters. Find a cabinetry professional on Houzz. Narrow your search in the Professionals section of the website to Poolesville, MD cabinets and cabinetry. You may also look through Maryland photos to find examples of cabinets that you like, then contact the cabinetry professional who worked on them.